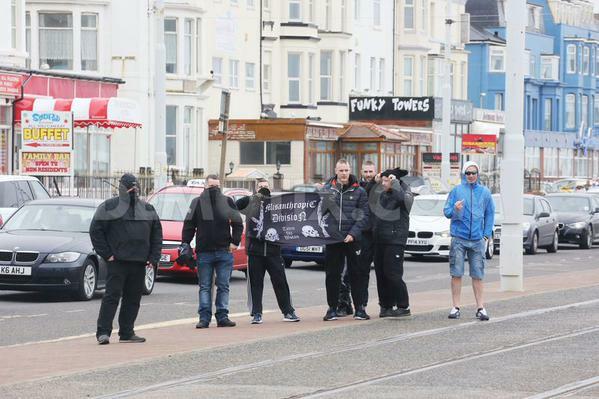 On Saturday, some Brighton Antifascists made the long journey to Blackpool to oppose the actual, relocated, March for England, alongside 70 or so antifascists from London, Manchester, Sheffield, Birmingham and further afield. Despite lots of big talk beforehand about hundred and hundreds of nationalists turning up, only about 40 actually made it to the march, with other, smaller groups wandering between pubs. Around 25 yards into their march, antifascists blocked the route, leading to the police turning the MfE around and ending their march. That was it, 40 people marching 50 yards in the pouring rain. Even the “commie hunters” who didn’t go on the main march failed, getting themselves nicked after trying to start a fight with some antifascists right in front of the old bill. Sieg Heils at the “family friendly, not racist” March for England. The march was notable for the fact that, despite organiser’s promises of a “family friendly, non-racist” day, neo nazis and white pride wankers were everywhere. 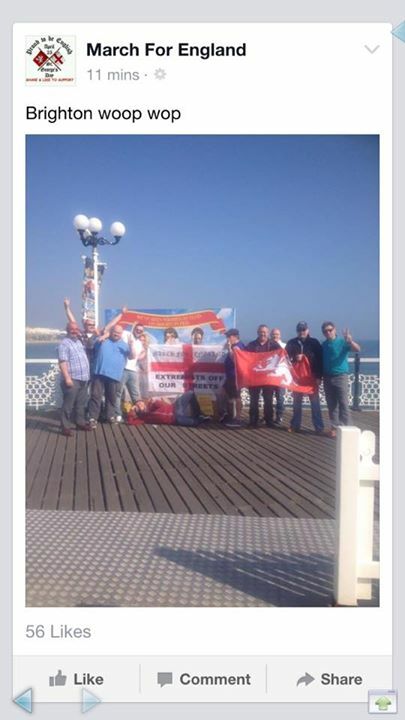 Even fascist wannabes National Action turned up, took a photo (and a nicking) and went home again. National Action looking kinda sad. 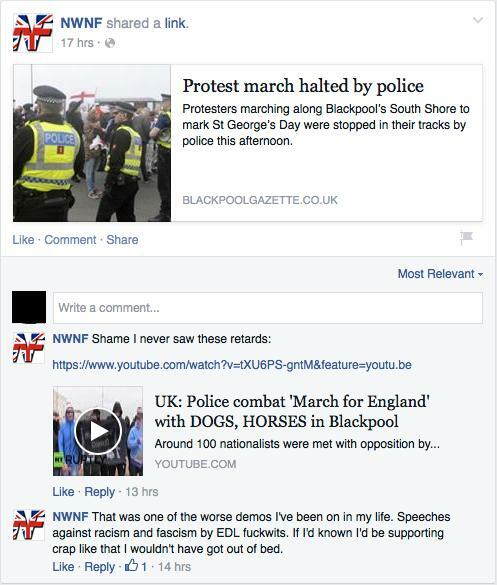 The march was apparently “not racist enough” for the National Front. After the “demo” was over, antifascists marched the route the fascists hadn’t managed to complete, took a quick photo, then headed home, safe and with no arrests. 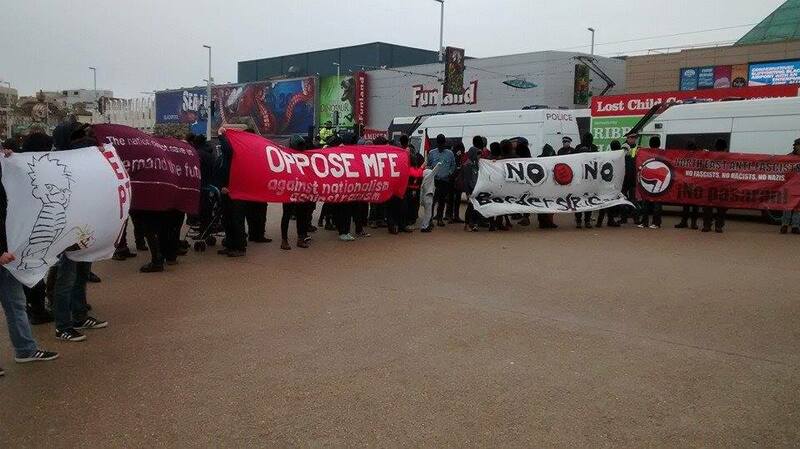 On Sunday, StopMfE hosted a community picnic on the Level in the centre of Brighton, celebrating Brighton being fascist and racist free for the first time in several years. 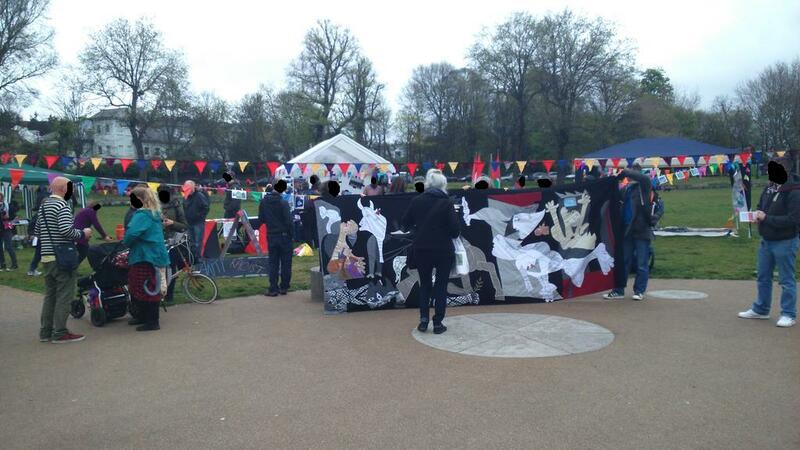 Various activist and community groups had stalls, tea and cake was serveded and people generally celebrated not having to yell at and confront Nazis. 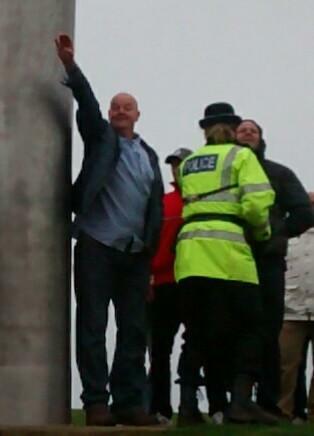 Despite threatening the event, far-right bottle-jobs “Pie and Mash Squad”, surprise surprise, totally bottled it. The Level is fascist free. Even though the weather wasn’t great, we had a good day networking and talking to people about antifascism (and flogging t-shirts!). All in all, a busy couple of days, but very successful. It’s worth noting that some fascist groups have already stated their intent to come back to Brighton next year, so I’m sure we’ll see you all on the streets soon. Posted on April 27, 2015, in Uncategorized and tagged antifa, antifascism, Birmingham, Blackpool, Brighton, EDL, Failure, Infidels, Manchester, March for England, MfE, national action, National Front, Nazis, Plan C, Sheffield, stopMFE. Bookmark the permalink. 2 Comments.